Was Timothy McVeigh Really Executed? The mystery surrounding the car that crashed into barriers outside the Houses of Parliament has deepened, as police insist it was not being followed by an unmarked police car. Even though CCTV footage shows the suspect’s vehicle was tailed by a white van as it sped through heavy traffic before crashing. As we’ve already noted, while the suspect may not have been followed by an unmarked police car he may have been tailed by the security services. In other words the ‘security services’ may have been tailing one of their brainwashed patsies as he carried a pre-planned attack aimed at heightening public anxiety over terror. Ed. 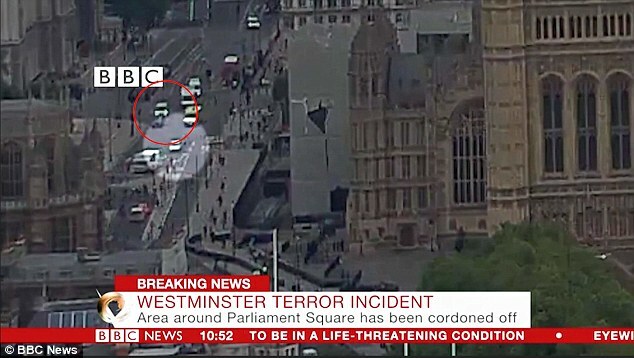 Police today denied the Westminster terror suspect was being followed by a mysterious unmarked van seconds before it ploughed into crowds. CCTV footage of the attack shows a silver Ford Transit clearly slowing down and then changing lanes as the Ford Fiesta veered towards Parliament. The mystery van stops after cyclists and pedestrians are run down and then changes lanes again to try to follow the errant driver who was on the wrong side of the road. But BBC footage of the crash, which remarkably didn’t claim any lives, shows the Transit gets stuck in traffic as the terror suspect smashes into road barriers. Today counter-terrorism chief Neil Basu ruled out that the Fiesta was being monitored despite experts claiming the CCTV shows the opposite. Mr Basu told journalists today: ‘No, I’ve heard that this morning. There wasn’t a police car in pursuit of the vehicle’. Experts, including retired Met detective David Videcette, who worked in counter-terrorism on 7/7, believes the Transit may have had a police officer behind the wheel. But it could be on a different job and noticed the strange behaviour of the driver. He said: ‘There appears to be silver Transit van following the Fiesta, the van has its lights on. The silver van carries on following the Fiesta wherever it goes. ‘The consensus between those of us who are ex-Police is that this is likely an unmarked police vehicle, who spotted the Fiesta acting strangely before it rammed the barrier.